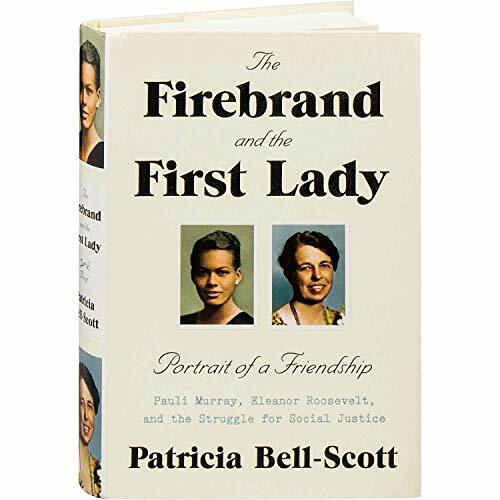 The Firebrand and the First Lady involves two women, Eleanor Roosevelt and Anna Pauline Murray. Many books have been written about Eleanor Roosevelt, but this one presents a different side of the woman many consider the most famous First Lady. The difference lies in the friendship she developed with a little known African American woman from Baltimore, Maryland, Anna Pauline Murray. Known by her nickname, Pauli, Murray came from dirt-poor roots yet rose to become a respected civil rights pioneer, author, lawyer, law professor, and co-founder of the National Organization for Women. President Franklin Delano Roosevelt created the Civilian Conservation Corps (CCC) to “rebuild the health and morale of unemployed” young men. Eleanor Roosevelt believed women would also benefit from such a program but ran into the usual sexism and paternalism barriers. The male dominated CCC leadership considered comparable women-only camps as an “extravagance that would undercut relief for men.” Women were supposed to turn to their families—not the government—for help. But for many women, including Pauli Murray, their families were not in a position to assist. Murray arrived at Camp Tera in 1934 “Suffering from poor nutrition, respiratory problems and exhaustion.” She was 24, of slight stature, and gave the appearance of “a small teenage boy.” That year Eleanor Roosevelt, the first lady of the United States, “made the scenic drive” from Hyde Park “to check things out for herself.” Little did Mrs. Roosevelt know how that visit would result in a friendship that would last for the rest of her life. Through correspondence, meticulously researched by the author, Roosevelt and Murray shared ideas, thoughts, and arguments about current events. At times, Murray believed Roosevelt was too reluctant to take big steps. Likewise, Roosevelt considered some of Murray’s ideas too radical to be practical. Yet in spite of their differences, these women developed a close friendship. Their correspondence reflects the genuine affection each shared for the other. And the letters they wrote show their somewhat prickly interactions when their ideas clashed. That is part of what makes this book such an interesting read. These women could not have been more different. Roosevelt’s background reflects the pedigree of privileged America. Murray came from the opposite end of the spectrum. The contrast between their backgrounds and their individual accomplishments reflect each woman’s determination to succeed in a world where women were (and in many ways continue be) considered inferior. Yet both achieved more than anyone expected. Eleanor is considered one of the most fascinating women of the 20th century; an activist First Lady the likes of which has rarely been seen before or since. Pauli rose from an impoverished beginning to become a leading advocate for civil rights. Their individual achievements were greater than women were thought entitled to attain. They came from distinctly different backgrounds. They had nothing in common but the friendship they developed over decades. They did not find the need to agree on everything, seeing their differences less as roadblocks than as opportunities to consider other viewpoints. The world today is not that much different from the one Eleanor Roosevelt and Pauli Murray inhabited. Their struggles continue to exist for women in the 21st century. And their example can provide the impetus to continue to improve and succeed.